Culms: Erect, stout, simple at base, branched above, solid, grooved on 1 side, smooth or nearly so, more or less waxy. Blades: Flat to rolled, 2 to 20 inches long, 1/5 to 2/5 inch wide, midrib prominent, upper surface ridged, slightly rough; lower surface smooth; margins rough; often soft-hairy, particularly near collar. Sheaths: Shorter than internodes, slightly keeled, smooth, waxy. Ligules: Fringed membrane, 1/8 to 1/6 inch long. Inflorescences: Racemes, 2-7, stalked, finger-like, 1.6 to 3.6 inches long, terminating main branches; stalks and joints of rachis copiously bearded with grayish to yellowish hairs 1/6 to 1/4 inch long. Spikelets: In pairs; sessile spikelet fertile, 2/5 to 1/2 inch long, glumes nearly equal, pubescent; stalked spikelet sterile; fertile lemmas awned or not, sterile lemma awnless. Habitat: Sand prairies and sandhills; sandy soils. 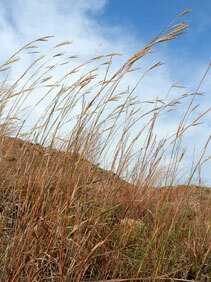 Uses: Sand bluestem is sometimes used on sand dunes or blow-out areas to control erosion. Comments: Sometimes called "turkey-foot". Intergrades with big bluestem Andropogon gerardii. Sand bluestem has elongated creeping rhizomes while big bluestem has short rhizomes or is non-rhizomatous.